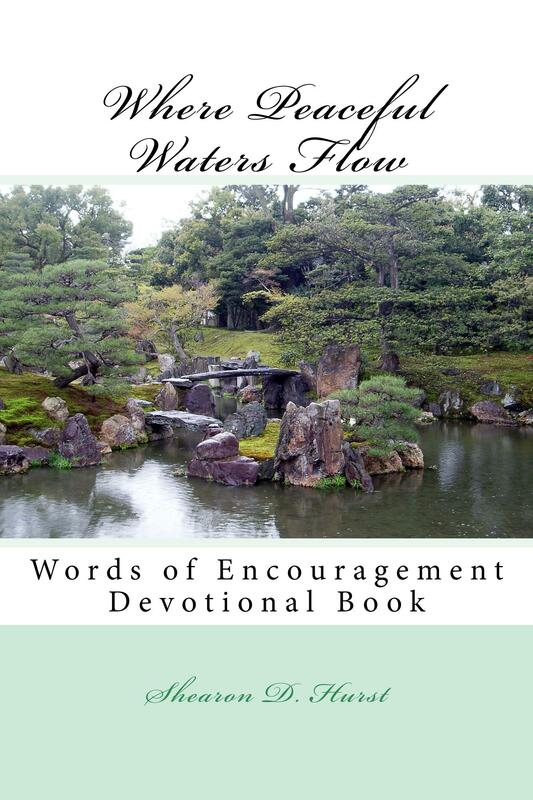 Where Peaceful Waters Flow – Words of Encouragement devotional is filled with God’s loving words of encouragement to His children. Where Peaceful Waters Flows is written as if you are spending time at the Master’s feet, and He’s ministering to you with refreshing words of comfort to feed your weary and wounded soul. Words which will minister, restore and revive you. Words which will change your mourning into gladness, and your dark night into day. Where Peaceful Waters Flow has over 300 pages of words of encouragement, that the Lord has ministered to me over the 10 years since starting the writing ministry. It took a lot of praying to find out how the Lord wanted me to put the book together, and which messages to include in the book because there were so many wonderful messages He had given me over the years. Therefore, Where Peaceful Waters Flow” was divided into two parts. The first part of the devotional book is called “BE STILL,” and it’s filled with words of encouragement for your time when you are meditating and prayerfully sitting at His Feet. The second part of the devotional book is called “ARISE Praying with The Father In the Midnight Hour” and it is filled with responses received from the Holy Spirit during prayer and intercession time from crying out to the Lord during the midnight hours in prayer. Do you want to experience Jesus like never before? Then come and sit at His feet. In Psalm 46:10, He tells us to “Be still and know that He is God.” When you take time to be still in the presence of the Lord, He will begin to minister and reveal things to you, which could have only been revealed by being still and soaking in His presence. Get ready to dwell in the presence of the Lord and be refreshed, renewed and strengthen, as the Lord pours His refreshing oil over you to revive your weary soul. It’s time for us to get back to an intimate relationship with Jesus. Come and sit at His feet. Come inside now and dwell WHERE PEACEFUL WATERS FLOW. I just want to say I am newbie to blogs and honestly loved this web site. Almost certainly I’m want to bookmark your blog post . You actually come with exceptional article content. Appreciate it for sharing with us your website.